Lexus just started a late summer sales push, dubbed the "Golden Opportunity" sales event, to get rid of some 2012s and make way for 2013 rides. One ad even focuses on their performance cars like the IS F and GS F Sport. And at one point, even the carbon fiber loom-a-licious LFA makes an appearance and slaloms down the course between all of them. 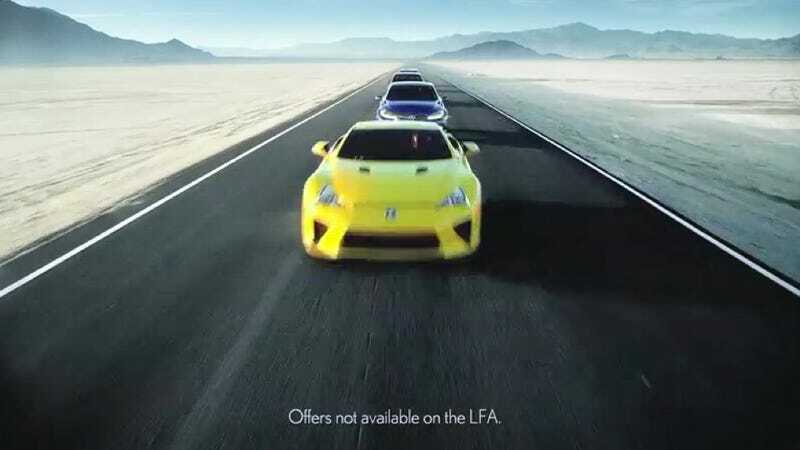 But that's when Lexus has to remind all of us that there are no offers available on the LFA. You know they did this because someone thought they'd be able to get 0% financing on an LFA during the last sales event. Looks like we'll have to find another way to get one on the cheap.